Hardware acceleration hereinafter refers to a kind of efficiency promotion technology in computing field, substantially on the basis of hardware, especially GPUs (Graphics Processing Units), through execution of a set of special algorithms. More specifically, it focuses on transcoding and processing DVD videos using encoder/decoder in GPU. The article will roll out from the (positive) influence of hardware acceleration on media (video/DVD) software or say, the activity participated by such software. Why You Need Hardware Acceleration in DVD Conversion? Compared with processor, the sequential structure of which makes it fail to execute some repetitive tasks in an expectedly efficient and rapid way, hardware accelerator however, is playing more roles in high-performance concurrent computing field. For example, as it is suited to intensive and massive data computing, the performances of gaming, rendering, and image algorithms have been boosted significantly thereby. Yes, what hardware acceleration excels at is concurrent computing, for example, 192 stream processors can be operated in parallel on GeForce 200 graphics card. Coincidentally, video encoding belongs to concurrent computing. For instance, motion estimation in MPEG-2 which requires large functional block can be greatly completed by hardware acceleration depending on granularity. That's why we take the advantage. How much faster can hardware acceleration drive for video processing? Things may be different. Take video rending with GPU acceleration as an example: the speed of rendering a 30-second AVC (.mp4) movie file with both CPU and activated GPU Processing using Sony Vegas or VideoFX Music Video Maker is 4-6 times higher than using CPU only. What about ripping a DVD using WinX DVD Ripper Platinum while turning on the GPU accelerator? We tested ripping an encrypted 132-minute movie DVD on an average Windows OS computer. ● This was a single DVD ripping test. ● The results may vary largely when different PC and GPU/CPU were used. Similarly, when processing a video file that is large in size and bit rate, it will be extremely painful without hardware acceleration. GPU encoding enables a general-purpose computer, even a low-end laptop, to convert DVDs with original image quality, because hardware acceleration has very low requirement in CPU and GPU. Currently, the absolute majority of GPUs can support the decoding of DVDs (and mainstream video formats as well) perfectly. ● For Intel: The mainstream laptops are equipped with Intel® i5 or i7 processors. That is to say, the majority of notebook users can make use of QSV for acceleration by checking "Intel" option under Hardware Accelerator item on WinX DVD Ripper Platinum (See the image, download .exe file). No matter whether your graphics cards are discrete or integrated, you can rip DVD disc to digital with hardware accelerator enabled. ● For NVIDIA: The GPU frameworks including Kepler, Maxwell (1st Gen, 2nd Gen, GM206), Pasal, Volta are supportive of NVENC-based Hardware-accelerated video encoding and decoding (See details >>). In other words, basically if you have GeForce or NVIDIA TITAN graphics card on your computer, you can make use of NVENC for faster DVD ripping. Even the old graphics card model like GeForce GTX650 is in the supported list. Intel® CPU (Intel® Ivy Bridge or higher) supports Quick Sync Video technology, which is used for video decoding/encoding. Its speed and image quality are comparable to NVIDIA CUDA or AMD Stream GPU acceleration. Also, the CPU usage is extremely low. NVIDIA has integrated specific H.264 hardware encoder – NVENC, which is way different from the predecessor – CUDA, which realizes acceleration by executing H.264 algorithm partially though general purpose computation of GPU. NVENC, however, does encoding through the hardware unit that is customized for H.264. You may have such experience if you are a frequent DVD user: when you play a disc, the DVD-ROM in a desktop especially in a laptop will be buzzing or heating up occasionally. That's because during reading a disc, the optical driver kicks into high gear. In CAV mode, the reading speed of CD-ROM is roughly 200 RPM/X, of DVD-ROM 575 RPM/X (DVD reading speed is calculated by Constant Angular Velocity or Partial Constant Angular Velocity). For a DVD, 1X speed is 1.385 MB/s, equal to 1.32 MiB/s, and a 16X DVD will be 16 times higher. That explains the big noise at high (say, 10,000) RPM during DVD burning. Different from the optical disk driver of a DVD player (hardware), the inner DVD-ROM of computer is more suitable for high-speed and continuous data reading. But if the back-end data processing is slow, the DVD-ROM will idle for most of time. Imagine how long it will idle since a DVD (DVD-9) can contain 8.5G video content! That is to say, when you play an over 2-hour movie, your DVD-ROM will be worn off for over 2 hours. The less time DVD-ROM operates, the less time laser head will be wasted. First off, copying the DVD out for playback will already ease the burden of DVD-ROM. Additionally, with hardware acceleration, the reading time of a DVD will be greatly shortened: it only costs 5 minutes only minimally to rip a feature-length movie (the time depends also on other factors). Furthermore, the No.1 fast and optimized DVD conversion of WinX DVD Ripper Platinum avoids idling of DVD-ROM at the extreme, reduces power consumption and prevents the temperature of DVD-ROM from being too high. Thereby, the lifespan of hardware and PC can be prolonged. According to our research, the useful life of DVD-ROM can be extended by 10 times or so. Also, your DVDs are protected for longer use. 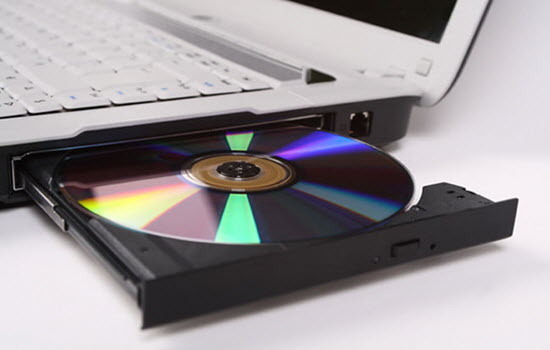 Tips: For a longer life of DVD-ROM, you should also dissipate heat and prevent dust. GPU-based acceleration will free the process of other apps from being influenced. The operating principle is simple: GPU serves CPU, and shares burdens of CPU. The fussy and repetitive tasks can be processed through massively parallel computing, or say, by small processors that are applied to massively parallel computing. With tasks being shunt, CPU can do more other things more efficiently without overload. Therefore, CPU can concentrate on processing other tasks. In this sense, GPU powers the acceleration of other applications. The in-operation application and computer won't crash or become slower during DVD conversion. Moreover, the temperature of CPU can be controlled in a reasonable range. During playing a DVD, the average temperature of CPU is 38 degrees centigrade. But some DVD ripper apps will raise it to as high as 80 degrees centigrade, which will make CPU out of work. But WinX DVD Ripper Platinum will let the temperature keep at 45 degrees centigrade or so averagely during conversion thanks to simultaneous CPU and GPU acceleration for decoding DVDs, and converting DVDs to MP4 (MPEG-4, H.264), AVI, MOV, WMV, HEVC, M2TS, MP3, iOS / Android / Windows devices, HDTV, gaming consoles, etc. It should be clear by now that hardware acceleration is a necessity for its huge advantage of helping decode encode video on the double. And it is no exaggeration to say that the power of GPU is finally unlocked correctly. But that's not a wrap. The theory behind hardware acceleration is in store here, supposing that all people are dying to hear why. Here is the plan: a general definition will be revealed first and then there comes a detailed flow of hardware accelerated video encoding process, followed by complete steps of how DVD ripper software makes use of hardware acceleration. Besides, an architecture analysis of CPU and GPU is appended to give an in-depth look at why hardware accelerated video processing is possible with GPU instead of CPU. To describe it in one sentence: the main principle of hardware acceleration is to offload compute-intensive operations from CPU to GPU through specific API (Application Programming Interface)/SDK (Software Development Kit) to make video encoding decoding processing more efficiently. Here take direct video encode with Nvidia CUDA/NVENC as an example. Each step is visualized to show the theory behind it. See the picture below. -> The client application (software) interfaces with hardware devices through API provided by computer hardware manufacturers, to access hardware capabilities. -> Then get the hardware devices Initialized and configured, and deliver the to-be-encoded video data to Graphics Driver via API. -> At this stage, graphics driver will work together with others like CUDA Driver or DirecX Driver if necessary. -> Once it gets ready, the graphics driver boots corresponding firmware and hardware to do the video encoding. -> The encoded bitstream will then be passed to software. How Does DVD Ripper Software Make Use of Hardware Acceleration? How does hardware acceleration facilitate DVD ripping process? An easy way to understand the implementation of hardware acceleration is to go through the whole decoding encoding process. Let's see the data flow chart below. -> Firstly, DVD ripping software extracts video audio data block from source DVD and decrypts it into original MPEG-2 bit stream packet. -> The final step: software packages the encoded video audio data into a standard multimedia file format. Read more: Does hardware acceleration lower video quality? No doubt that GPU assisted video encoding decoding is faster than the process solely counting on CPU. The yawning speed gap is mainly caused by architectural differences, whereas the architectures differ from each other is due to the original intentions of design. Surely, video coding is a kind of floating-point computation. But can we just jump to the conclusion that CPU is a loser when speaking of floating point arithmetic? Most of the answers lie in the architectures. Firstly, take a look at the next pictures of CPU/GPU architectures and see what information can be extracted. 1. Control refers to the control unit in CPU that manages processor's all operations, including directs data, instructions and other units' operations. 2. ALU, an abbreviation of Arithmetic logic unit, is a combinational digital electronic circuit that specializes in logic and arithmetic operations. 3. Cache and DRAM (Dynamic random-access memory are components to store data. You might be in a daze for such a result. After all, GPU, consisting of incredibly large numbers of smaller ALU cores in parallel architecture, looks every inch the more powerful data calculator than CPU. Especially, there is a saying that CPU only excels in logic operations while GPU leaves CPU in the dust in computing ability. Well, the following is the truth. Although a CPU has only few ALU (Arithmetic Logic Unit) cores for serial operations, companied with huge control unit, its ability to perform single core floating point operation is actually far better than GPU. Each CPU core has its own cache memory for executing serial operation and is optimized for handling different tasks and doing complex equations rapidly. Even if we kick out factors like instruction set, massive cache and branch prediction, the winner still goes to CPU, for it has higher clock speed than GPU, like 4 GHz vs. 1 GHz. Yes, this is a complete reversal, and there are plausible reasons. GPU cores are good at performing same instruction in parallel at the same time but on different data, which is known as SIMD (single instruction, multiple data). Today a standard graphics card like NVidia GeForce GTX 1080 ships with a total of 2560 CUDA cores while the newest and top of the line Intel® Core™ i9-9700X X-series processor has at most 18 cores. GPU is designed for executing multiple tasks simultaneously. It follows that, no matter how amazing a CPU core is, it can't defeat 1000 GPU cores at the same time. Of course, this only happens in specific computing tasks. But luckily, graphics processing or floating point arithmetic (for example iDCT, motion compensation and deinterlacing) is exactly one of them. And that's why hardware acceleration can be enabled while encoding decoding video. Still feel dizzy? Take a look here. Suppose that CPU is a master of arithmetic, capable of addition 100 times per minute, while GPU is a schoolboy doing additions 10 times per minute. Now there are 10000 addition and subtraction that will be finished by 10 masters and 1000 schoolboys. Which team do you think will finish first? The answer is obvious. Where the GPU lacks in intelligence and complexity, it makes up in quantity. That's why hardware accelerated video encoding decoding processing is possible with GPU instead of general-purpose CPU. The mainstream hardware acceleration technologies are released by Intel, NVIDIA and AMD. All of them take boosting video transcode speed as a focal point, because this is the function of GPU computing that can really hit the average consumers. Well, when did they launch their first hardware acceleration technology? What changes did they make over the past years? How did they balance speed and quality? Which GPUs support those cutting-edge technologies? Now let's take a look at the three manufacturers' achievements in hardware acceleration. Intel® holding the largest share of the integrated graphics market introduced Clear Video Technology - CVT for short - through GMA X3000 in 2006. However, it showed up later than the other two's. At first, this technology was limited to accelerating MPEG-2 video decoding. While in GMA X4500HD offered by G45 chipsets, it added full hardware-decode of MPEG-2, HD WMV9B (iDCT/VC1), H.264/AVC and more mainstreaming video compression standards. It can process videos up to 1080P. Later, a set of post-processing features, named as Intel® Clear Video HD, were added to Intel® Clear Video. Thanks to Clear Video, HD video playback no longer consumes a massive amount of CPU resource, as so to lay the foundation for performance support for multi-tasking environment in modern digital family. However, the increasing demands for creating, editing, transcoding and sharing videos raise new requirements on the multimedia processing capability. Users are no longer satisfied with the enhancement on office and game performance. They hope video processing which is always quite long and drawn out gets dramatically boosted with the help of next generation processor. For that, Intel® disclosed a new technology - Quick Sync Video (aka. QSV) - at its Developer Forum in 2010, and officially introduced it with Sandy Bridge CPU microarchitecture early in the next year. Differing to Intel® Clear Video Technology that supports hardware decoding only, Intel® Quick Sync Video can be utilized to speed up both decoding and encoding, several times video transcoding speed of previous products. That's why WinX DVD Ripper Platinum and other programs work much faster after Intel® QSV being integrated. Plus, QSV can easily cope with 1080P MPEG-2, MPEG-4, VC-1, AVC and other video codecs. Till now, Intel® has already developed 6 generations of this technology. With the release of the third generation of the Intel® Core processors with Ivy Bridge as the code name, Intel® Quick Sync Video is upgraded to version 2 making transcoding speed faster and CPU usage lower. Version 3 is introduced with Haswell microarchitecture. Version 4 integrated into Broadwell adds the support for VP8 hardware decoding. Version 5 obtains the capability to perform a full fixed-function H.265/HEVC main/8-bit encoding and decoding acceleration, hybrid and partial HEVC main10/10-bit decoding acceleration, JPEG encoding acceleration for resolutions up to 16,000×16,000 pixels, and partial VP9 encoding and decoding acceleration. The sixth edition is further enhanced making it possible to conduct full fixed-function H.265/HEVC Main10/10-bit encoding and decoding acceleration & full fixed-function VP9 8-bit & 10-bit decoding acceleration & 8-bit encoding acceleration. NVIDIA® PureVideo turns up earlier than Intel® Clear Video. It is paired with GeForce 6 series in 2004 and has been updated to the ninth generation PureVideo HD by far. About two years later since its debut, GeForce 7 was released featuring a more advanced PureVideo HD technology. The upgraded version added the support for HD DVD and Blu-ray, and shouldered two steps of HD decode - Motion Compensation and Deblocking. It can partly reduce CPU usage, but it isn't full hardware-decode. NVIDIA's full hardware-decode doesn't come until the emergence of 3rd PureVideo HD initially discovered in G98 GPU. It can realize complete hardware-decoding for all 3 video codecs of the Blu-ray Disc format: MPEG-2, VC-1, and H.264. In 2007, NVIDIA worked out the world's first solution for general-computing on GPUs - CUDA (Compute Unified Device Architecture). It is a parallel computing platform and programming model already used in GeForce, ION, Quadro and Tesla GPUs. CUDA-enabled products can boost the completion of the most CPU-intensive and complicated computing tasks from video/audio encoding to science research. Hence, virtually all consumer-level video applications add the support for CUDA acceleration quickly. 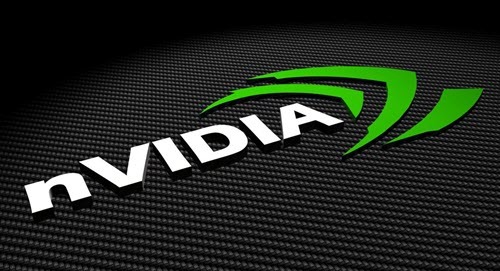 In 2012, NVIDIA issued a more advanced technology - NVENC. Like Intel® Quick Sync Video, NVENC uses dedicated encode-accelerating unit making it faster than CUDA which applies general computing unit and maintaining quality as same as that CUDA delivers. NVENC has upgraded to the fifth generation since its introduction with the Kepler-based GeForce 600 series. The third generation introduced with Maxwell GM20x added the support for HEVC and 4K 60Hz H.264 video encoding. The fourth generation introduced with Pascal GP10x implements HEVC Main10 10-bit hardware encoding, doubles the encoding performance of 4K H.264 & HEVC and supports 8K HEVC. Likewise, there're a lot of programs supporting NVENC encoder. 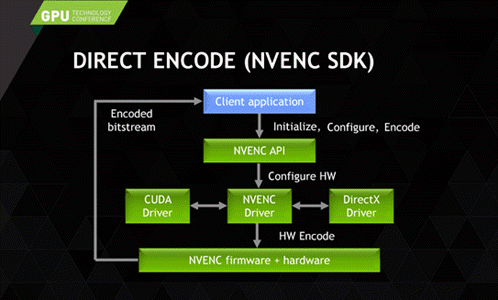 Accompanying NVENC in NVIDIA's Video Codec SDK is NVDEC which is designed for video decoding. It is formerly known as NVCUVID being the part of the NVIDIA CUDA Toolkit. 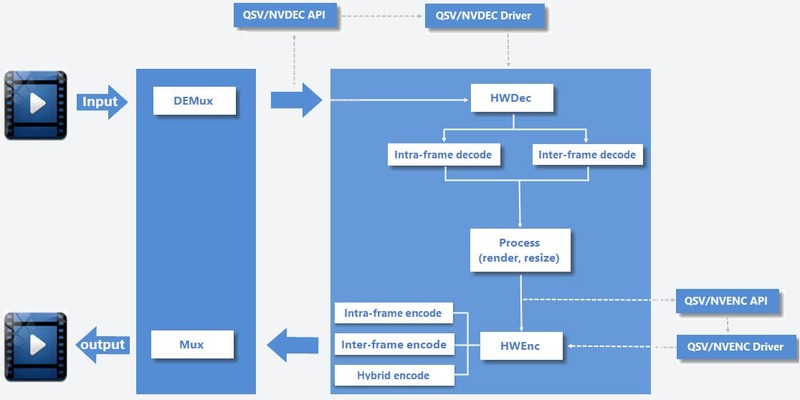 NVDEC supports MPEG-2, VC1, H.264 (AVCHD), H.265 (HEVC), VP8, and VP9, but the supported codecs vary with the GPU architecture. The rival of NVIDIA® PureVideo and Intel® Clear Video is ATI Avivo. It is presented on the ATI Radeon R520 family of GPUs and all later ATI Radeon products. This technology is aimed at the five items in video playback, namely, capture, encode, decode, process and display. At hardware level, Avivo supports decoding H.264, MPEG2, MPEG4, WMV9, VC1, DivX and WMV9 PMC, and also encoding the first five formats. At that time, Avivo is fully compatible with MPEG2 while PureVideo isn't, which helps it to be the top position in applied domain. But the biggest draw to Avivo is the support for H.264 which plays a big role in high definition videos. The weakness is that Radeon X1000 series can't support full hardware- encode and decode of H.264. In the second year of CVT's appearance, namely 2007, AMD rolled out UVD (Unified Video Decoder) aiming to handle H.264 and VC1 used in Blu-ray and HD-DVD. With UVD technology, the graphic card can achieve full hardware-decode of H.264 and VC1 HD videos without consuming CPU resources and meanwhile reducing the power consumption. UVD first appeared in ATI Radeon HD2000 Series, ranging from high-end HD2900XT and mid-range HD2600 to low-end HD2400. Since then, UVD has becoming an indispensible and significant part of all AMD GPUs. In 2008, UVD2 was introduced with RV770 to fight against NVIDIA dual-stream decode. It can easily decode ultra-high bit rate video, support higher resolution including 2160P, and embrace multi-stream decoding which means that it can decode multiple HD films simultaneously. In 2010, UVD3 arrived with the Radeon HD6000 series. Apart from H.264 and VC1, it offers hardware acceleration for MPEG-2 bitstream, MPEG-4 part 2 ASP (also known as DivX/xVid) and Multi-View Codec (MVC) - the only codec used in Blu-ray 3D movies specifications. AMD keeps updating UVD in the following years, launching UVD4, UVD5, UVD6 and UVD7. While developing UVD, AMD also worked on VCE - Video Coding Engine. 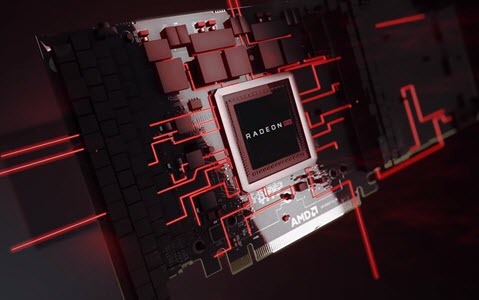 AMD made its first appearance at Radeon HD 7900 on December 2011. 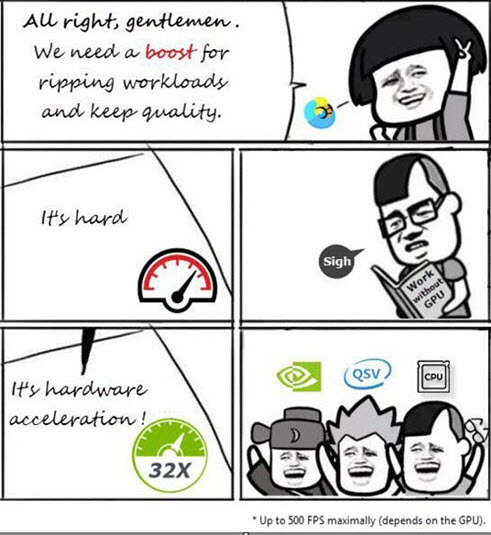 And since 2012, it was applied to all of their GPUs and APUs except Oland. Totally, there're four generations, from VCE 1.0 to VCE 4.0. VCE 1.0 supports H.264 YUV420 (I & P frames), H.264 SVC Temporal Encode VCE, and Display Encode Mode (DEM). VCE 2.0 adds H.264 YUV444 (I-Frames), B-frames for H.264 YUV420, and improvements to the DEM (Display Encode Mode). VCE 3.0 obtains a new high-quality video scaling and the support for HEVC. Meanwhile, it is bundled with UVD 6.0 and put in the third generation of Graphics Core Next (GCN3) with "Tonga", "Fiji", "Iceland", and "Carrizo" (VCE 3.1) based graphics controller hardware. And the currently final version VCE 4.0, together with UVD 7.0, are used in Vega based GPUs. Next, AMD brought about VCN (Video Core Next) in the Raven Ridge series of APUs released in October 2017, as the successor to both UVD video decoding and VCE video encoding blocks. VCN supports encoding MPEG-4 AVC and HEVC/H.265 and decoding HEVC/H.265, MPEG-2, MPEG-4, VC1, MPEG-4 AVC and VP9. It supports 10bit, 1080p 240FPS/4K 60FPS. To compete with NVIDIA CUDA, AMD launched ATI Stream Technology in December of 2008. ATI Stream is a stream processing technology capable of making the most of parallel computing capability of AMD GPU to accelerate software process and large-scale scientific computing. Different from CUDA based on its own private standard, ATI Stream is based on OpenCL. In October 2010, ATI was officially replaced by AMD with the unveiling of Radeon HD6800 series. Accordingly, ATI Stream got updated and renamed to AMD APP (AMD Accelerated Parallel Processing). Which GPUs Support Nvidia-based Hardware Acceleration? * Dependencies: NVENCODE API - NVIDIA Quadro, Tesla, GRID or GeForce products with Kepler, Maxwell and Pascal generation GPUs. Which CPUs Support QuickSync-based Hardware Acceleration? As we can see, Intel, NVIDIA and AMD have never stopped developing and polishing their hardware acceleration technologies over the past decade. Intel produces an advanced Quick Sync Video technology featuring overwhelming superiority in video processing speed, while NVIDIA's hardware acceleration technology wins by output quality. With Intel QSV and NVIDIA CUDA/NVENC embedded, WinX DVD Ripper Platinum with unique level-3 hardware acceleration is able to make a delicate balance among processing speed, image quality and output file size, to lighten the load on CPU, and to prolong the service life of DVD drive and discs.